Lyman Frank Baum was born in Chittenango, New York, on May 15, 1856 to Benjamin Ward and Cynthia Ann (Stanton) Baum. The seventh of nine children, he was named after his uncle, Lyman Spaulding. When he was four years old his father closed the Baum Brothers Barrel Factory and moved the family to Syracuse, New York, to pursue a career in the oil business. Benjamin Baum developed a number of profitable wells in the oil rich fields of Pennsylvania which made the family quite wealthy. They lived in considerable luxury on a country estate which Mrs. Baum christened "Rose Lawn". Baum spent most of his childhood there indulged by his family, partially because he had a weak heart and also because his parents wanted to spare their children the rigors of their own childhood's. 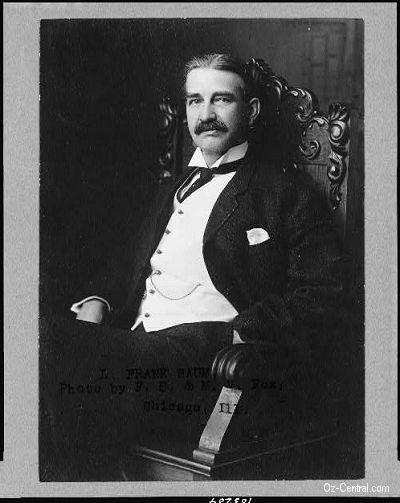 In 1868 L. Frank Baum was sent to the Peekskill Military Academy where, after the comfort and indulgences of Rose Lawn, he spent two miserable years and suffered a heart seizure brought on by the rigors of army life. At home once more he was given free reign to his interests, taking his hobbies to far greater lengths than other children due to his father's ability to cater to his wishes. When he was 15 his father bought him a printing press, and for three years he and a younger brother issued a newspaper called The Rose Lawn Home Journal. It included short stories, poems, riddles, scientific, and nonfiction articles. When he was 17, Baum and his older brother Harry began a paper titled The Empire , which was published by a friend, Thomas G. Alford. The paper featured, among various topics, news about postage stamps, and in 1873 Baum published a directory of stamp dealers. Baum's early adulthood was characterized by the sampling of a variety of professions. Besides an actor he was also a playwright, theater manager, newspaper reporter, salesman, and chicken breeder. It was as a breeder that he began a magazine called The Poultry Record and published his first book, The Book of the Hamburgs, A Brief Treatise upon the Mating, Rearing, and Management of the Different Varieties of Hamburgs. (1886). In 1882, after the artistic success of his Irish melodrama, The Maid of Arran, Baum married Maud Gage , the daughter of leading American suffragist Matilda Joslyn Gage. In the next six years two sons were born and Baum, delighted by fatherhood and with an inborn ability to please children, exercised his fertile imagination by recounting to the boys countless stories, At this time, Baum was working in the family oil business but after the death of his father in 1887 it was discovered that a clerk had embezzled most of the capital of the company. Putting this disaster behind him, Baum moved his family to Aberdeen in South Dakota, and walked straight into two others. Baum's Bazaar was a variety store which was foreclosed in 1889, due mainly to the fact that Baum refused to accept money from destitute customers. The Aberdeen Saturday Pioneer  was a newspaper acquired in 1890 which closed in 1891 due to the competition of two daily and seven weekly papers already well established in the town. The Baum family, now with two further sons, moved to Chicago in 1891 where Baum was successively a reporter, a department store window dresser, and a traveling chinaware salesman. In 1896 he applied for copyright on his first two children's books, Adventures in Phunniland and Tales from Mother Goose . The Mother Goose book was published in 1897 as Mother Goose in Prose by Chicago firm Way & Williams with illustrations by Maxfield Parrish. This collection of short stories, with an appearance of a little farm girl named Dorothy, is also Parrish's first book. Spurred by this success, Baum then began producing The Show Window, a magazine for window dressers which was an immediate success . Driven by the impetus of these works, and now in his early forties, Baum decided to earn his living as a writer. Together with artist William Wallace Denslow he produced Father Goose: His Book  in 1899 and in so doing created a publishing sensation which sold nearly 60,000 copies. Father Goose was soon to be forgotten, however, with the release of Baum and Denslow's next work. Written in 1899 and published in 1900, The Wonderful Wizard of Oz  was a huge success with the public and critics alike. In a scrapbook once owned by Baum there where 202 reviews, of which only two were unfavorable. Many of the reviewers, such as The Bookseller, compared it with Alice in Wonderland. Baum did not initially recognize the importance of the book and continued to publish other works until The Marvelous Land of Oz appeared in 1904. This was written partly because of the success of the first book and partly to stem yet further financial troubles (Baum had been declared bankrupt in 1903). Launched on a tide of Oz projects, the book was a great success. Baum was at the height of his productive powers and a huge range of books were published between 1904 and the launch of the third Oz book, Ozma of Oz , in 1907. From this point on, Baum, at the request of his publishers, produced one Oz book a year. Each was as popular as the last and although they tended to vary in quality, they were certainly more successful than any of his other works. This said, Baum was increasingly keen to work on fantasy books which did not feature Oz and so, with the appearance of The Emerald City of Oz in 1910, came the announcement that the adventures of Oz were coming to an end. In the two years before The Emerald City of Oz, Baum's financial affairs had become increasingly entangled, and by 1910 the situation was do serious that he assigned all rights to his Bobbs-Merrill books to a group of creditors. For all the sacrifice this move undoubtedly was (the rights to The Wonderful Wizard of Oz were not regained by Baum's widow until 1932), it was of little help, and in 1911 Baum was declared bankrupt. By this time he had moved from Chicago to the small California suburb of Hollywood, where he wrote his next two non-Oz books. Neither repeated the success of the books that had made his name and so in 1913, because of the bankruptcy and because of the overwhelming number of letters from children asking for 'more about Dorothy', Baum published The Patchwork Girl of Oz and became, until his death, the Royal Historian of Oz. Baum continued to publish an Oz book once a year, with a whole generation of American children growing up with the tradition of an adventure in that far away land every Christmas. In February 1918 Baum entered the hospital, writing to his publishers that he had "finished the second Oz book - beyond The Tin Woodman of Oz - which will give you a manuscript for 1919 and 1920. Also there is material for another book, so in case anything happens to me the Baum books can be issued until and including 1921." Baum survived his hospital operation but spent his last year bedridden, dying nine days before his 63rd birthday in 1919.